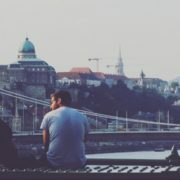 Just like all of us, Budapest too has its good and bad days. Sometimes, all you might wish for is a place to cuddle up, get cozy and sip some hot beverages to warm you from the inside, as you hear the rain pattering against the windows (instead of on you!). 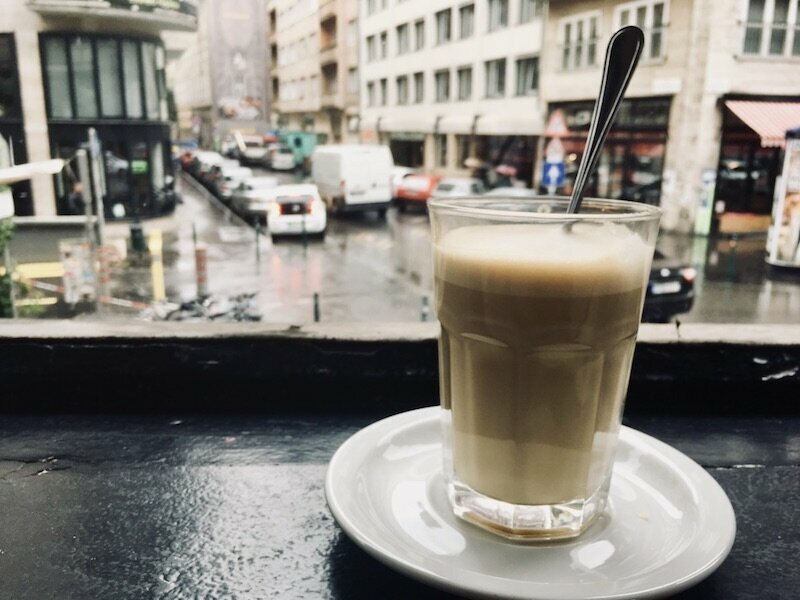 We totally feel with you here, and since we won’t let any kind of weather keeping us from leaving the house, we have collected 9 super-cozy cafés in Budapest for you, that will totally compensate for every single raindrop and gust of wind. At these places, you can come alone, with friends, have great conversations, read a book or just stare out of the window and wind down for a few hours. Let’s stop the hating on winter, the cold and the wet and get cozy instead! “Rengeteg” means both “thick forest” and “a myriad”. 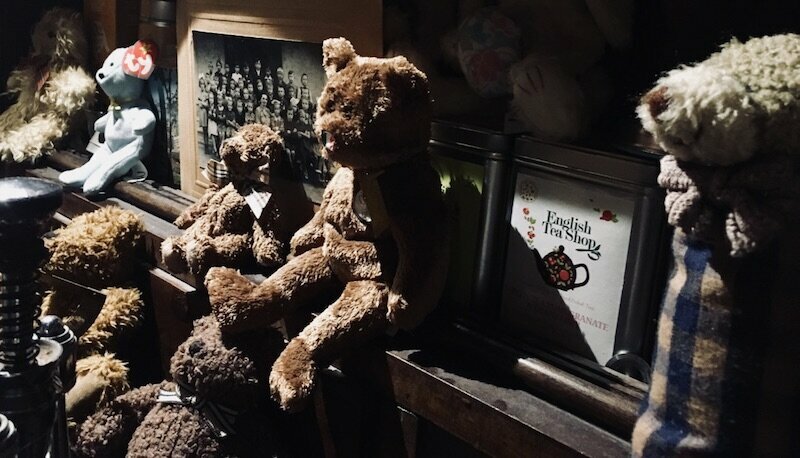 It really describes the place well, since it’s a thick forest of a myriad of teddy bears, old toys and little antiques which paired with the dim light make for a super high coziness level. Seriously, you’ll feel like falling down into a little fairytale-rabbit hole once you enter the basement of this low-key building tucked away in district IX. The hot chocolate is heavenly and it comes in infinite variations, depending on your preferences. They also have a super wide selection of teas; there should be one for everyone’s taste. This is the place to shut out and forget about the world’s problems and your own. At least for a little while. 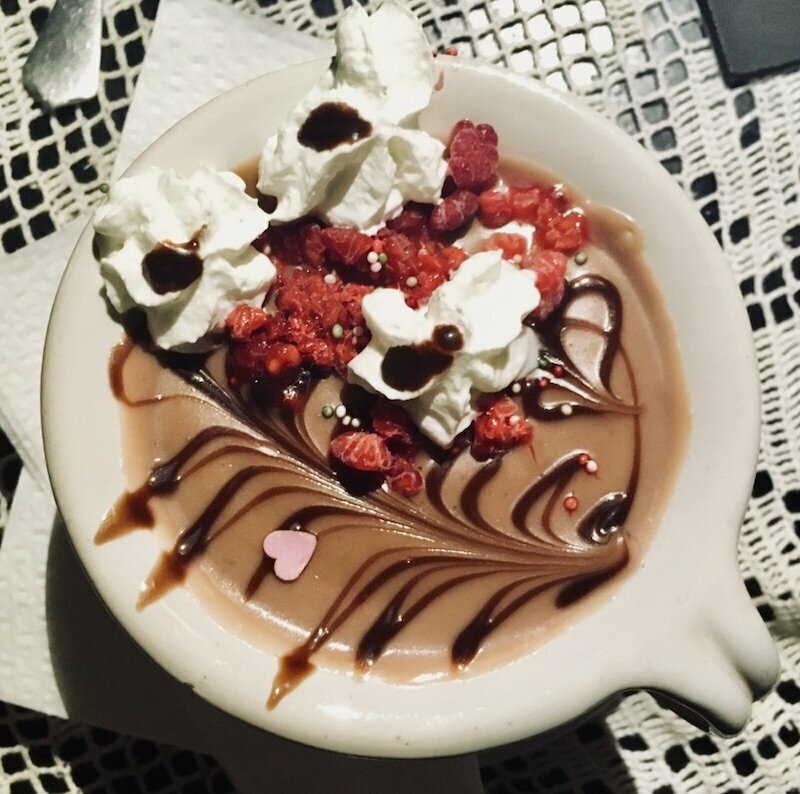 Special Coziness Factor: Teddy bears and a hot chocolate you won’t ever forget. Massolit is somewhat the definition of coziness. 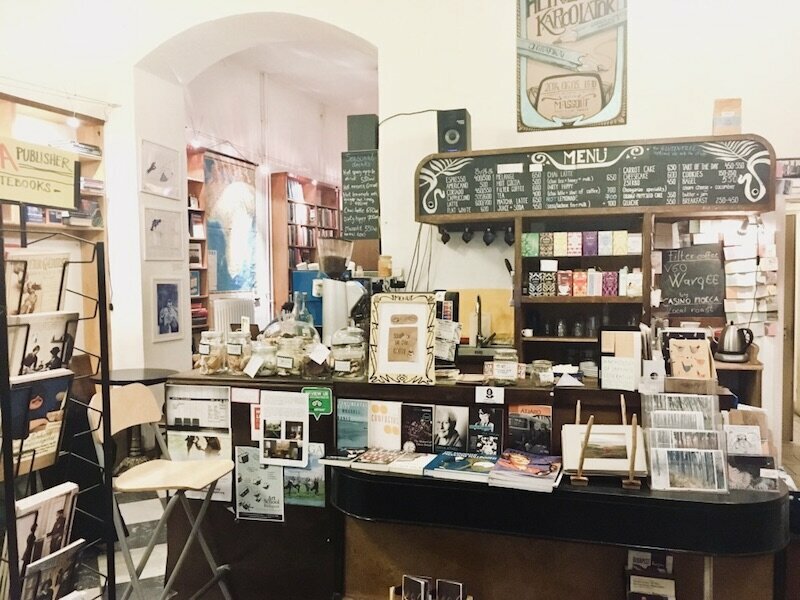 This little Jewish bookshop and café will totally put you under its spell and will keep you for a lot longer than you intended. Maybe its just us, but we feel that books have an especially snugly air around them, and this place is full of them! The coffee is delicious and don’t even get us started about their homemade cakes. Our tip: Go for the carrot cake! 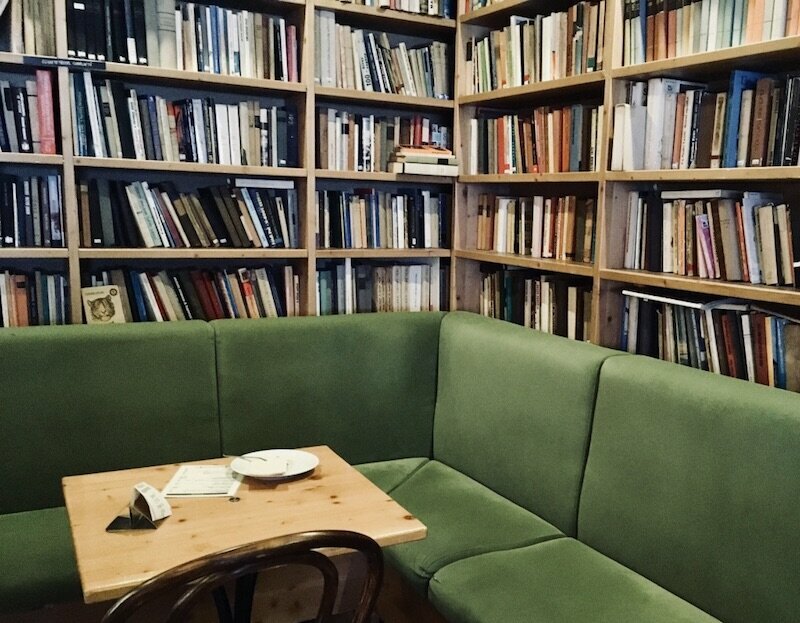 As the place is small, it might often seem that all tables are occupied, but don’t forget to check the little room in the back, plus Massolit has a table-sharing policy: As long as there is space left at a table, you’re free to sit there! The Bedő house is undoubtedly one of the most beautiful buildings of whole entire Budapest. Even if you’re not a fan or expert of architecture, this house and the little café inside will still totally enchant you. Although it’s in the very centre of Budapest close to the Parliament, only few people know about it, which is a pity. 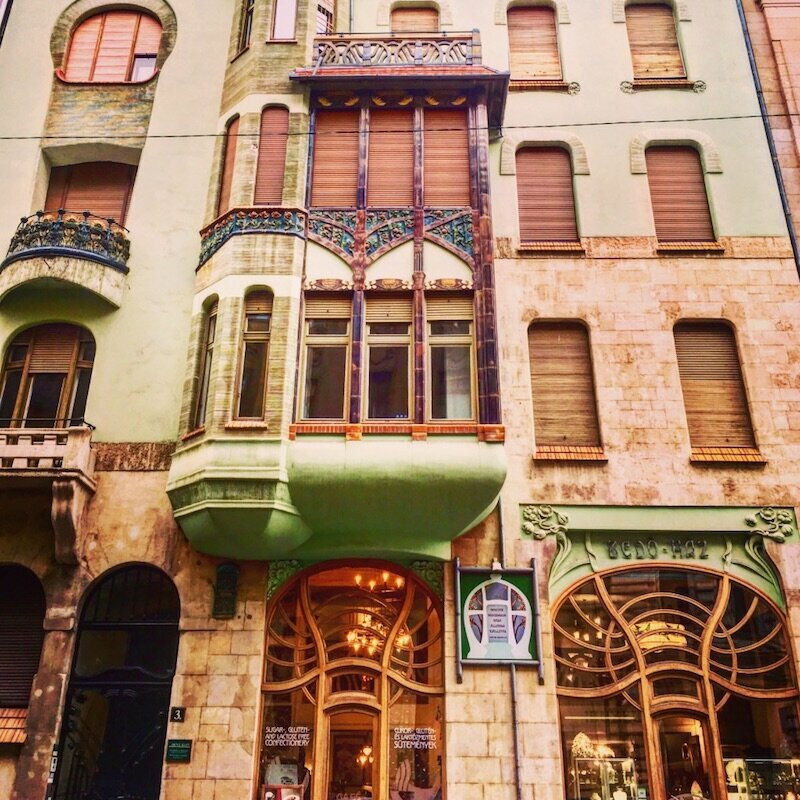 The whole building itself is a stunning display of Art Nouveau architecture and decoration, both from the in- and outside. The café inside is full of beautiful pictures from the turn of the century and a stunning tiffany lamp hanging from the ceiling. 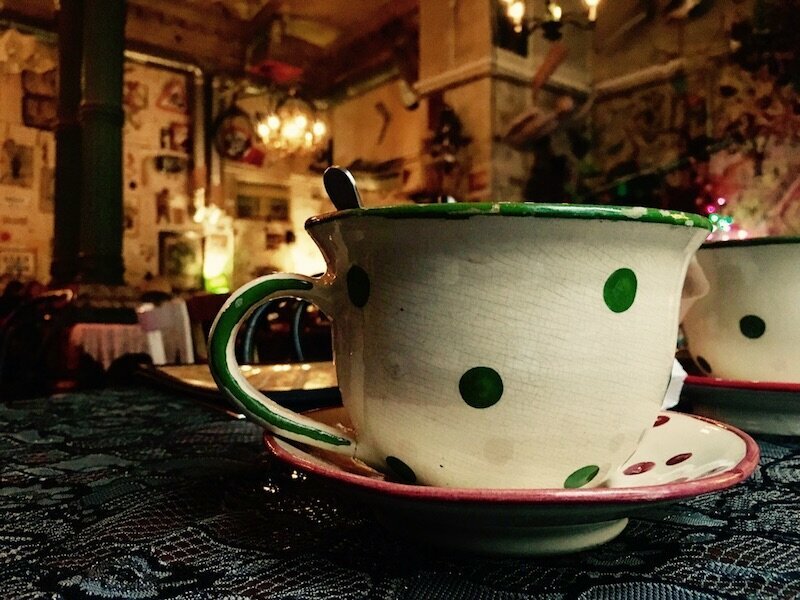 Drink a coffee and enjoy the atmosphere of the blooming time of the early 1900s! Coziness guaranteed! Here, you’ll not only escape the weather, but the whole era for a little while. Extra tip: If you have time, visit the museum of Hungarian Art Nouveau, too for some impressive furniture and decoration scattered across three floors. … and the café from the inside! 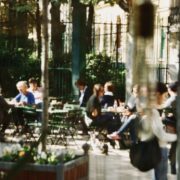 “Konyha” literally means “kitchen” in Hungarian, but this place is so much more than that. For us, it’s rather a living room with a lovely view on Budapest’s streets on the upper floor. This gets especially nice and cozy, when the rain is pattering against the windows. Konyha is a place for many things – the apartment-like interior makes it especially easy to stay for a longer time, either dreaming, reading, talking or even working. 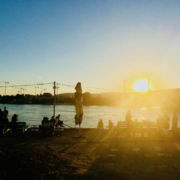 For us, it’s the ideal place to escape and drink a big, hot latte if Budapest’s weather lets us down again. If you’re into time travel, Zsivágó is definitely your place to be on any wet day. 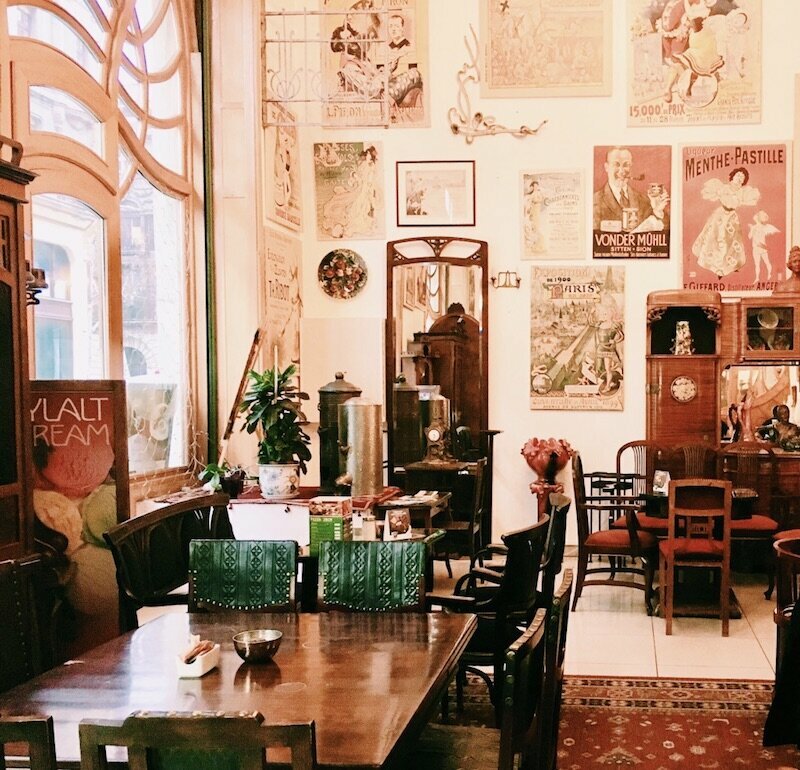 This café will take you back to your great-grandma and her flat and furniture and you will totally forget it’s 2018 already. The interior is just perfect, from the crockery to the tables, chairs and decoration everything resembles an era long gone. The hot chocolate is spot on; definitely try the one with oranges! The service is really friendly and the whole place just has a laid-back snugly air that will warm you from the in- and outside. Perfect for any rainy and cold day! Csendes is another fairytale rabbit hole we more than gladly fall into anytime. 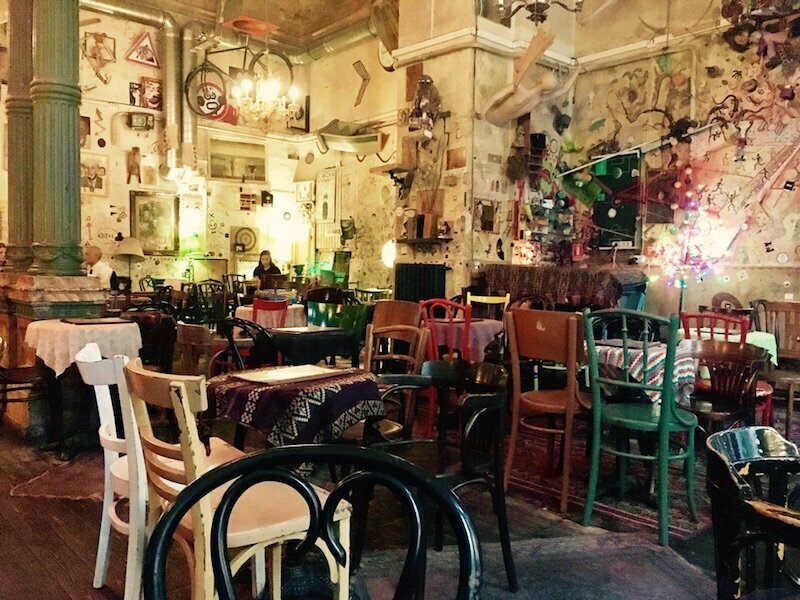 Although by now it has kind of become a classic amongst Budapest’s “ruin cafés”, it still managed to stay very local, friendly and welcoming. Csendes probably has the biggest café latte in town (if you ask for the big one) and it comes in a super retro dotted cup we last saw in kindergarten. Heaven! The interior is a total sensory overload in the best possible sense; the lights are dim and the lampshades are old which makes for a perfect twilighted winter-coziness. 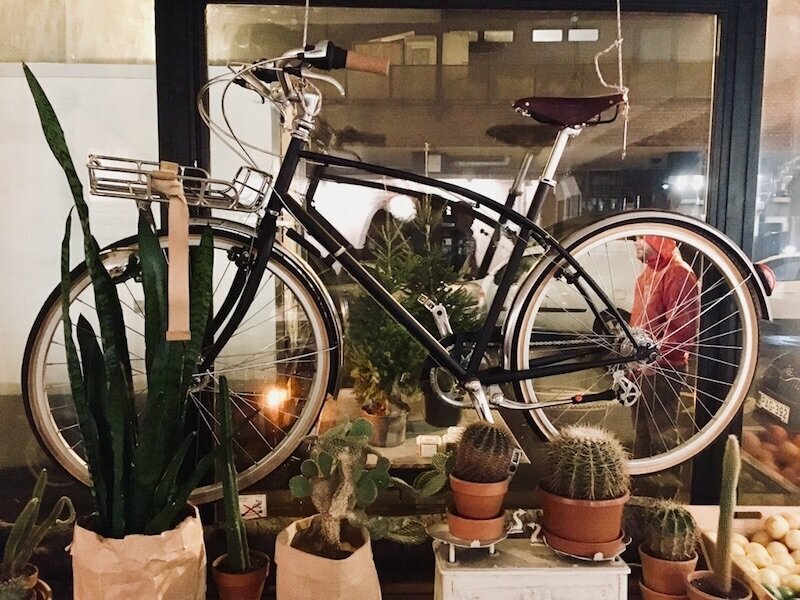 Csendes is another place to linger away for hours and every time you look around, you’ll spot a new piece of decoration you haven’t seen before. One of our all-time favourites! 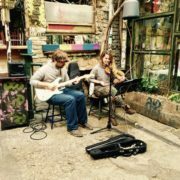 Tucked away in the undervisited 8th district, the “blue horse” (Kék Ló) is truly a place to fall for. 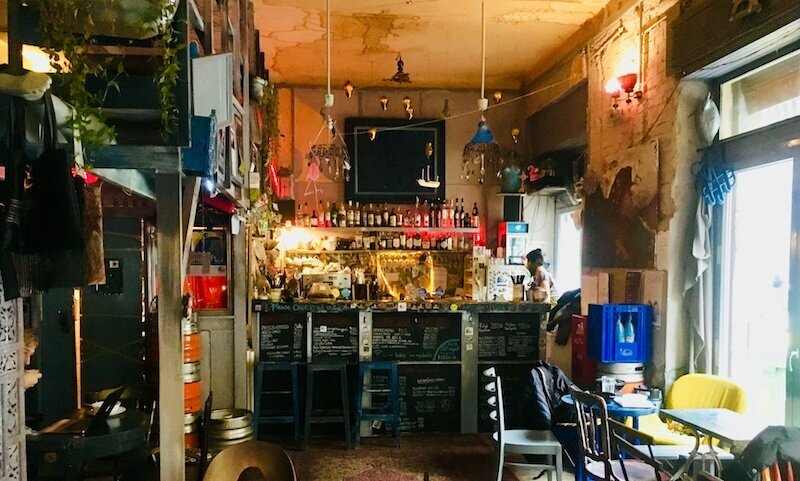 This place is nothing for the fancy types; it’s a truly “handmade” hangout frequented by locals who want to have a nice time in great company. The little “gallery” with all the cushions and the small stairs leading up are definitely a place to dwell and forget about the time. 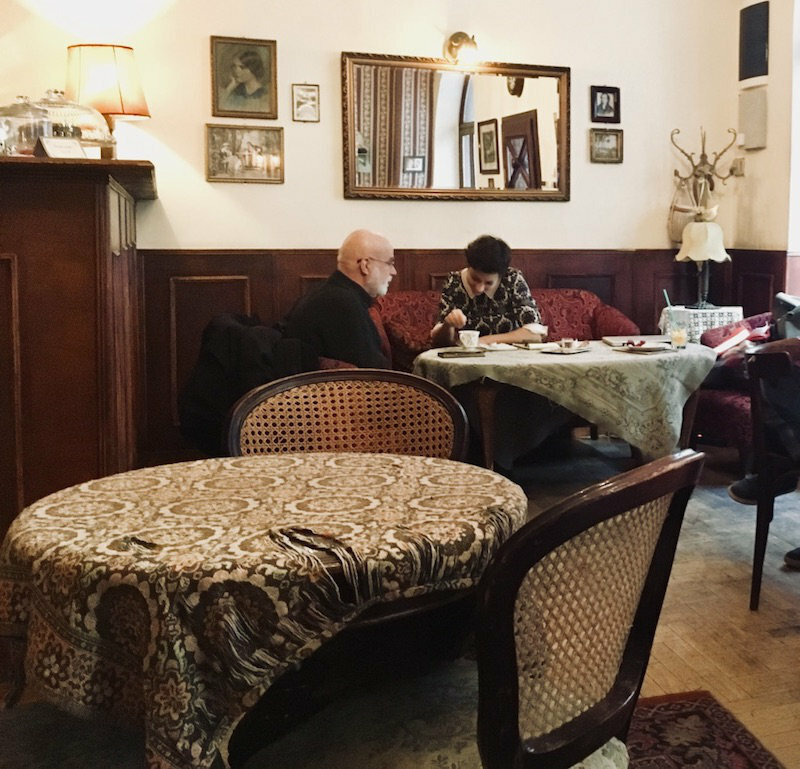 We love Kék Ló for its authenticity, the crowd it gathers and its peculiar interior, which together make it a perfectly nice and cozy escape from any bad-weather day. 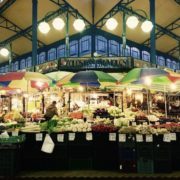 Oh, and they have great and fresh vegetarian and vegan food every day at a very decent price! What’s not to love? 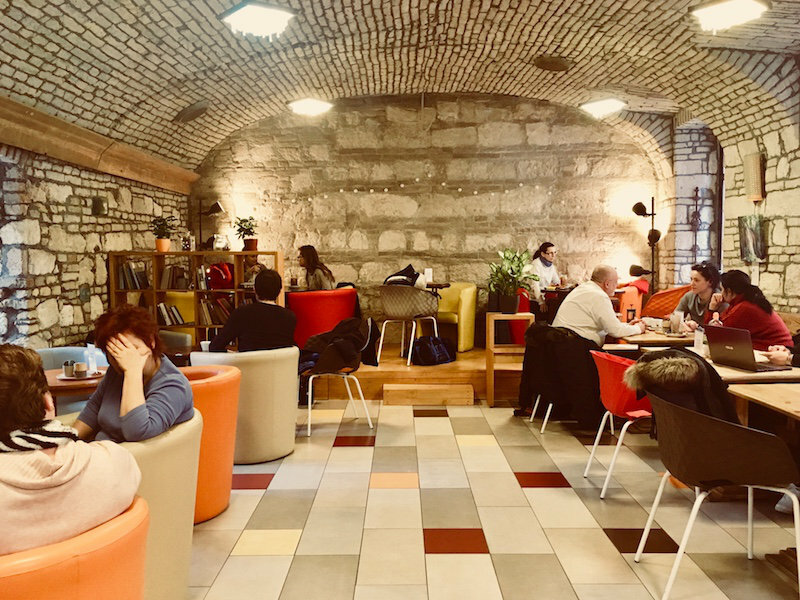 Adna Café is our latest discovery located right at a side street of the famous Ráday utca close to Kálvin tér. We instantly fell in love – stepping inside felt like like entering the cosiest wine-cellar, except that coffee is the main focus here. The bookshelves and boardgames make for a super homely atmosphere and the service is exceptionally friendly, helpful and knowledgable. You can pick from two types of roasted coffee beans (light and dark) and neither of them will disappoint you. Plus Adna’s mission is to help people with drug addiction, so every coffee is a direct contribution to a good cause. A perfect haven for any rainy and cold day! Special Coziness Factor: Your coffee addiction will probably save someone with drug addiction here! Kelet café draws its heavenly coziness from two things: The books on the lower and the bright gallery and huge windows on the upper floor. You can come here whichever mood you’re in – if you feel like holing up, grab yourself a book and stay on the ground floor. 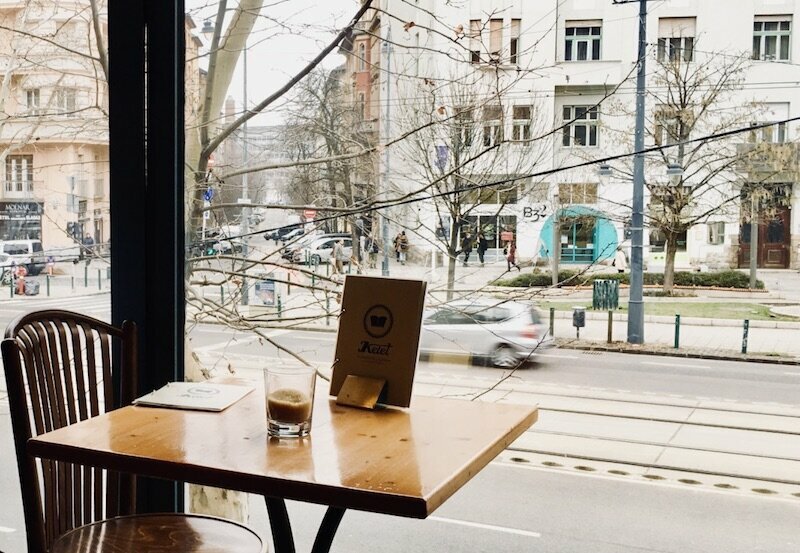 If you need brightness and feel like people watching, head up and look down on the pulsating Bartók Béla Street from the huge windows. The coffee is awesome, plus Kelet features numerous decently priced fresh snacks and homemade cakes which we can highly recommend. It’s is a place where you can open your laptop, book or heart to a conversation and stay as long as the rain passes. One of our absolute favourites! … and upstairs, on the gallery! We really hope these 9 beacons of snugness will help you survive even the worst days of Budapest. What are your favourite places to curl up with a hot drink and listen to the rain? Let us know in the comments below! Need more than coffee? 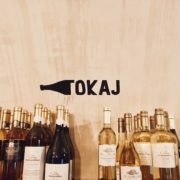 Here are our 16 favourite casual wine bars in Budapest. 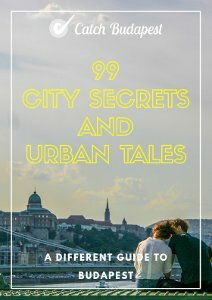 For even more entertainment see our 30 Amazing Things to Experience in Budapest in Spring 2018 – Your Ultimate Bucket List.